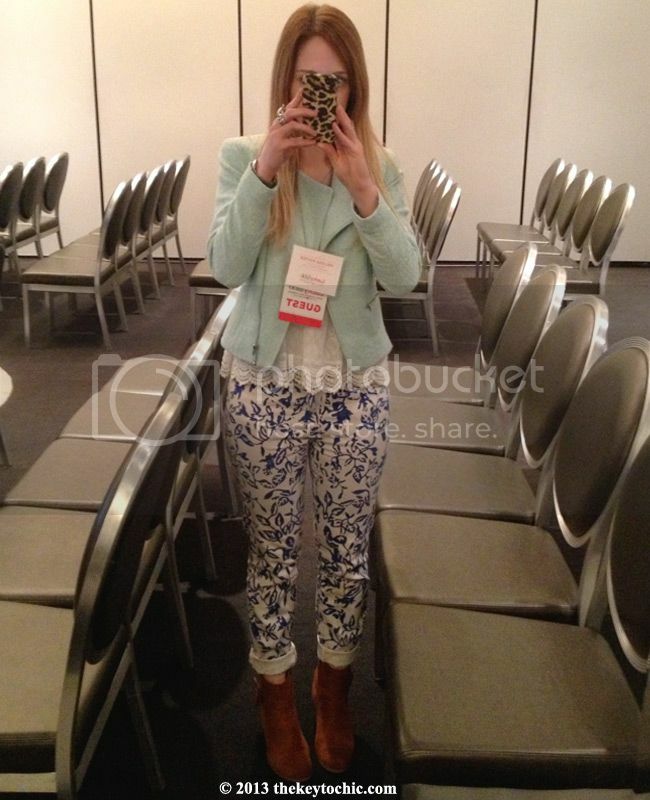 After several years of live streaming fashion blog conferences, I finally attended one in person. 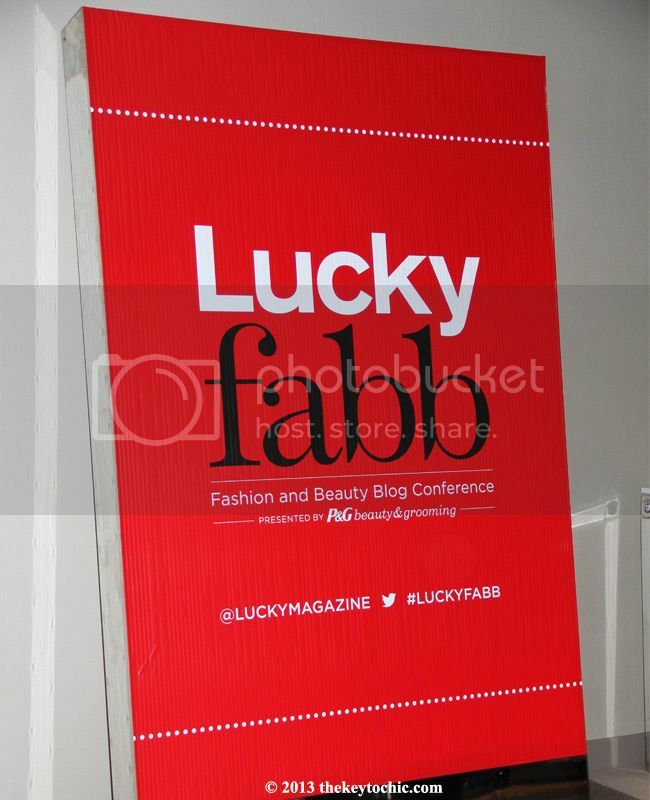 Last week I spent two high-energy days with blogging pal Toni at Lucky FABB listening to speakers such as Drew Barrymore, Betsey Johnson, Kelly Osbourne, Alle Fister of Bollare, Hillary Kerr of WhoWhatWear, Eva Chen, and Mandana Dayani of Rachel Zoe Inc.
At the end of this post, I'll summarize some of the words of wisdom and advice that I think are key for fellow fashion bloggers. Since I've been blogging for over six years, I've realized how much I've learned, researched, and grown. To be frank, most of the things that I heard at the conference were things I'd already learned on my own. In my early blogging days, when I didn't know something, I'd stay up late at night reading books and researching specific topics online. Blogging is a constant learning process, though, so there's always something new to learn. 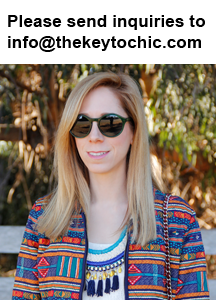 These days, bloggers really do have to be a jack of all trades. We should have strong skills in marketing, social media, public relations, writing, graphics, legal/copyright issues, photography, networking, advertising, pitching, and so on. You may think, but I'm a fashion person, do I really have to know all these things? Yes! It's important to be well-rounded. It's essential to know what SEO, CPM, CPC, ROI, conversion rates, alt tagging, deep linking, keyword optimizing, crowdsourcing, affiliate advertising, content marketing, and beta testing are in order to build your brand, be professional, and position yourself for success. If you aim to make blogging more than just a hobby, then you should think of your blog and yourself as a brand. 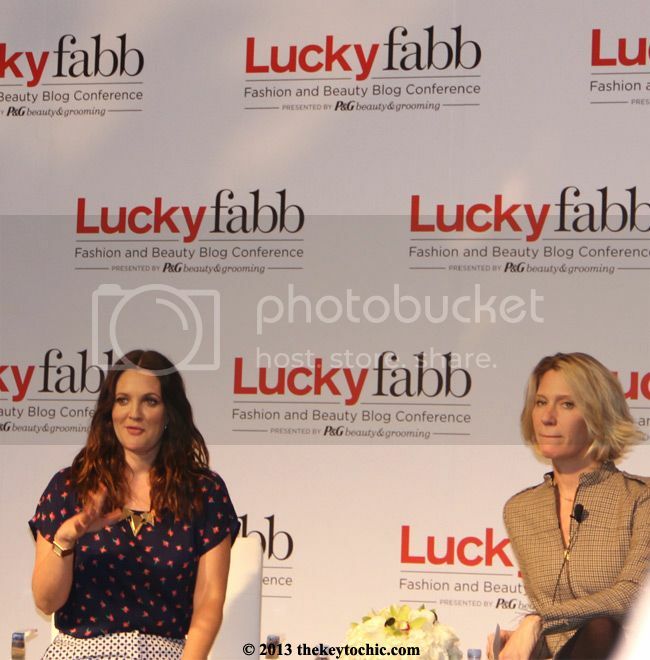 Not surprisingly, Drew Barrymore's presence on day one ignited a flurry of photography. What resonated with me when she spoke was her candid response to a question about being a mom and how to do it all. Her answer was that you can't have it all, that something has to give. Whether you agree or not, you have to love her honesty. I was also intrigued that she has collected makeup (especially discontinued products) for many years. Her favorite makeup product? It's concealer. Betsey Johnson is every bit as energetic and adorable as she appears on the runway when she does cartwheels. Her presence lights up the room and it was amusing to see so many bloggers greet her enthusiastically and chase her down for photos. Here's my look for the first day of the conference. I'm wearing a Duro Olowu for JCP sweater under a Marni at H&M jacket with Cheap Monday jeans, a Merona bag, and Mossimo leopard print pumps. My look for day two consisted of a white lace peplum top from Papaya under a mint blazer from H&M, DvF loves Current/Elliott jeans (last seen here), and Papaya ankle boots. The iPhone case is by J. 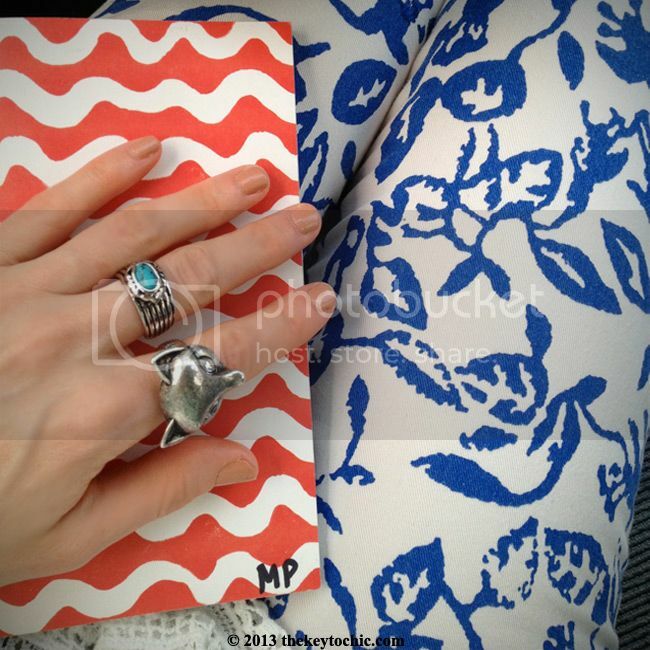 Crew, the rings are F21, and the wavy striped notebook is by Duro Olowu for JCP. Instead of posting photos of the tempting and colorful candy and sweets that were present, here's some healthy food inspiration that's more in line with my healthy eating habits. 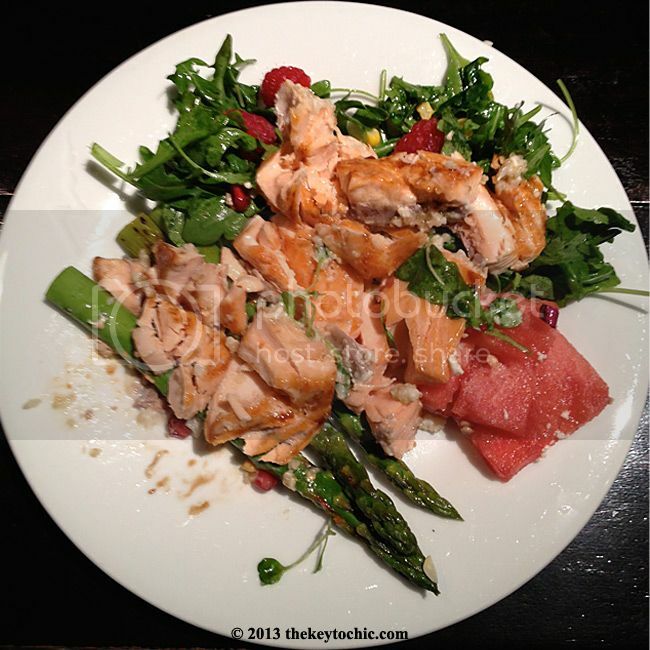 My lunch on day two included mouth-watering salmon, arugula, raspberries, watermelon, and asparagus. 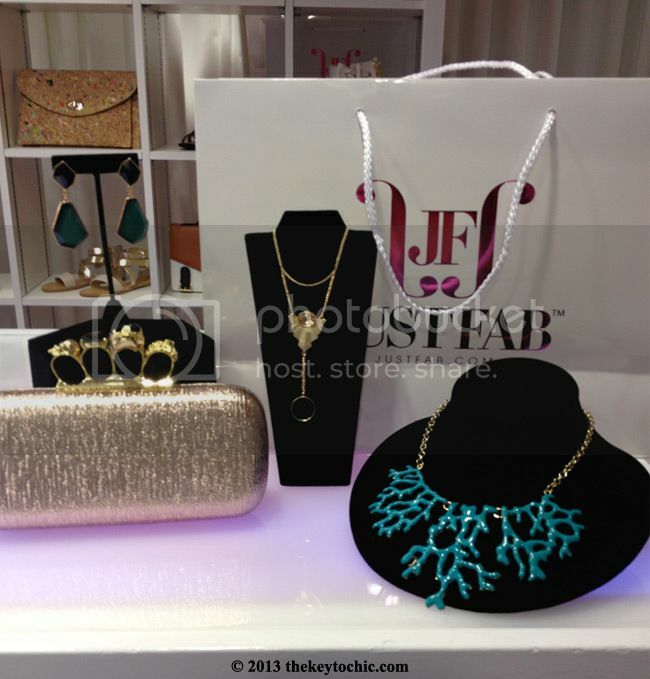 Being a shoe addict, I ogled the selection of accessories at the JustFab suite. In addition to some of the heels, I've also got my eye on the blue necklace, as I think it would be perfect over a pink, lemon, or coral blouse. I spent a few minutes trying out the Covet app and creating outfits from designers' collections. Warning - this app is potentially addictive. Think digital paper dolls, on-trend themes such as "Call of the Wild", and social media all rolled into one. The best part is how easy it is to use. Here's the casual look I created in the Covet app (in about sixty seconds) with blue pants, strappy heels, a metallic top, and textured blazer. The AG Jeans booth showcased three denim looks and immediately appealed to the denim hoarder in me. I lucked out and I actually won one of these looks in a contest. Let's see how well you know my style. Can you guess which one I picked? Content is king. As a blogger, your priority should be creating great content. My tip: when it comes to content, think quality over quantity. Proofread, edit, and revise your posts. Then do it again. Via Kelly Osbourne: dress for yourself and nobody else. Wear something if you feel amazing in it. Own everything that you do, and admit when you're wrong. Invest in nice shoes, bags, and a blazer. Everything else could be vintage or high street (fast fashion). Via Hillary Kerr: listen to what your readers are interested in. Comparison is the death of happiness. Use social media for casual conversations and for sharing what you love. Aim to inform, inspire, and empower. Ask yourself what sets you apart and what brings you to the next level. Via Eva Chen: when starting out as a blogger, go at your own pace, on your own terms. Focus on creating content, not on the number of followers you have. The followers will come if your content is great. Create different content across your social media platforms to make it feel fresher. Tailor the content to each platform. Cross promote with other bloggers and friends. Via Erin Wallace of Crossroads Trading: when pitching to a brand, think like a marketer, pre-introduce yourself by tweeting them or featuring them on your blog, "ace the test" by being professional and showing them you love them, and be a great partner by sharing with your readers, pitching ideas to the brand, and promoting your content. Via Emily Schuman: refrain from saying yes to everything, it's important to say no to projects and brands that don't match your vision. (I could not agree more!) Find your vision and stay true to it. Be nice to people and enjoy what you're doing. The best content is authentic. Use Alexa and Compete to understand your audience. Think of yourself as a business with specific goals. Via Mandana Dayani: to be an authority, you have to be credible. Knowing who you are shapes your next steps. Have a great sense of self. Via Alle Fister: throw a sharp dart (be specialized and skilled in your area/niche) and have a clear vision. Via Andrea Chao, Director of Advertising at Guess: confidence is persuasive, find a mentor, and research what you're interested in. Be concise when pitching an idea or project to a brand. Know the brand's history and do your research. The three basic formats for monetization are: sponsored posts, ad exchanges, and affiliate marketing. Under promise and over deliver when working with brands. Understand and ask what the company wants to gain from the relationship. With affiliate marketing, understand how much you're earning on an effective revenue per click basis. **I hope you find this information helpful and inspiring in some way! The energy and enthusiasm that I experienced at the conference is something that live streaming simply can't provide, and for that I'm grateful. 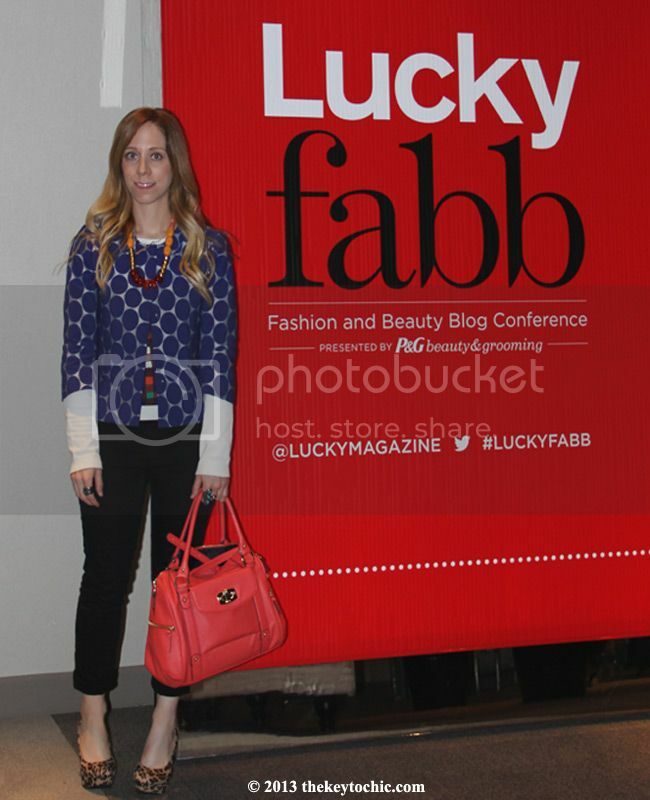 I also enjoyed seeing so many familiar faces in the blogging world, as well as new ones!